If the mother-to-be is crazy for pachyderms , why not throw her an all-out elephant baby shower? There's lots of cute ways to decorate. Use an elephant themed baby clothesline as the main focal point and then grab some playful elephant toys to scatter around the room. Carry the theme onto the buffet table with a cute cake or cupcakes and of course you'll want to get the gang together using an adorable elephant baby shower invite. I've featured three of my personal favorites here but there's lots more where these come from. Each of these affordable invitations can be easily personalized and come with a white envelope and a 100% satisfaction guarantee. 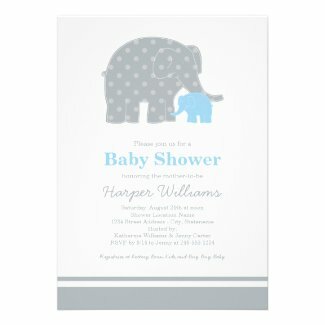 I found an entire board dedicated to an elephant theme baby shower at Pinterest. Have a look! You'll find that many of the ideas include cute plush elephants. These can be used as decorations that can be given to the mommy-to-be when the party is over. Did you find anything helpful here? Have you got any ideas that haven't been mentioned yet? Please feel free to share your thoughts. We love hearing from you!